Valentine’s Day is exactly a week away and to celebrate, Reno family dentists Dr. William Wager and Dr. Brian Evans want to talk to you about the health benefits of one of the most popular Valentine’s Day treats: chocolate. While it’s important to remember that sugar is detrimental to your teeth, we want to tell you why it’s okay to reach for a piece of chocolate during a moment of weakness. 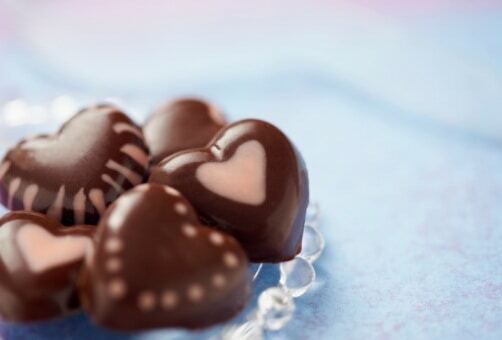 Chocolate is good for your heart because it can actually help lower blood pressure when consumed occasionally. This is because chocolate improves blood flow, therefore helping to prevent the formation of blood clots and the hardening of the arteries. Because chocolate improves your blood flow, it’s good for your brain, specifically improving cognitive function and having a positive effect on your mood. This is thanks to phenylethylamine (PEA), which is found in chocolate and is the same chemical your brain creates when you feel like you’re falling in love. Chocolate helps control blood sugar because it keeps your blood vessels and circulation healthy, both of which help to ward off type 2 diabetes. The flavonoids in chocolate also help to reduce insulin resistance, which helps your body use insulin efficiently and prevents large spikes in blood sugar levels. Chocolate is full of antioxidants, meaning it helps to keep your body free of harmful bacteria, as well as protects against certain cancers and slows the signs of aging. Chocolate is full of vitamins and minerals, including potassium, copper, magnesium, and iron, which help prevent against stoke, cardiovascular health problems, anemia, high blood pressure, and diabetes. According to the ADHA’s website, “Chocolate may inhibit the bacteria that produce cavity-causing acid,” meaning that chocolate can prevent against tooth decay. Although it may be hard to believe that candy can protect your teeth from cavities, a part of the cocoa bean, the main ingredient in chocolate, has been proven to cause less tooth decay than other sweet treats. Additionally, chocolate contains theobromine, which has shown to harden tooth enamel, protecting your teeth even more from the attack of cavity-causing acid, plaque, and bacteria. To reserve your post-Valentine’s Day dental cleaning, call Wager Evans Dental, located in Reno and serving the communities of Sparks, Spanish Springs, Hidden Valley, and the surrounding areas, at (775) 800-4845.